1) Sonic 4 Episode 1. This game is sluggish unless you hit boosters which are constantly all over but even with those it still feels sluggish and the physics aren't great. I was right not to care about this game but I'll finish it even so just to say I did. Episode 2 looked so much better so I bought that upon release and Episode 2 is just a way better game imo. 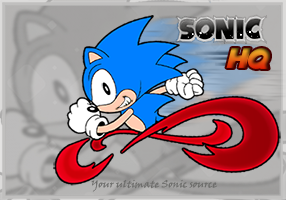 2) Sonic Unleashed. I initially dodged this due to lots of high profile games releasing around the same time and reviews being bad but as far as I'm concerned the story is better than Generation's story and the game play is just as great during day stages. As for the werehog that everyone complained about? I think it's just fine and in fact I like it. It's kind of like a childish God of War. I wasn't too keen on it at first but when I started leveling him up and got stronger with more combos it was great fun! Still haven't beat it but will get there. At first I didn't like the fact you had to find sun and moon ruins to progress but now I'm liking it, it gives you a reason to go back and explore. I was kinda late to these two but oh well. Anyone else have different or similar opinions? Kinda wished that Sonic 4 Episode 2 and Episode Metal were released on the Wii's shop channel back in it's heyday, but Episode 1 is pretty decent IMO. Sonic Unleashed is and awesome game, even the werehog stages are okay, although at first I didn't like them. As for Sonic 4 I only played that on the Wii, I thought it was okay, but only Episode I was released on the Wii, So I have never played Episode II or Episode Metal. I don't know why they weren't released. One Sonic game what took me a while to start playing was Sonic CD. I never had a Mega CD, so it wasn't until the game was rereleased as part of the Sonic Gems Collection on GameCube. At first I liked the game, but then I didn't. It wasn't until recently that I thought the game was good again, but I never finished it. I thought the last boss was tough. (02-22-2019, 12:36 PM)Zamau Wrote: Sonic Unleashed is and awesome game, even the werehog stages are okay, although at first I didn't like them. As for Sonic 4 I only played that on the Wii, I thought it was okay, but only Episode I was released on the Wii, So I have never played Episode II or Episode Metal. I don't know why they weren't released. Episode 2 used a more demanding graphics engine I believe so it wasn't on every device like the first episode.